With this ticket, you will enter the Field of Screams within your 30 minute ticket window. You must arrive 15-20 minutes prior to your ticket time in order to enter the Field of Screams within your 30 minute window. Arriving 15-20 minutes prior to your ticket time will allow the necessary amount of time for parking and transportation to the field. Bring your printed ticket or barcoded ticket that has been downloaded on your smartphone to be presented upon entry. Each ticket purchased will be scanned and valid for one entry per person. All online purchases are subject to processing fees. All sales final. In the event of a rainout, timed tickets will be honored any other night we are open. Please call or e-mail for information. All sales are final. No refunds. In case of closings or delays, your timed ticket will be honored any other night we are open. In this instance, please call or e-mail for information. Arrive 15-20 minutes prior to your scheduled ticket allowing time for parking, passing through security checkpoint, and transportation to the field. Upon arrival, proceed directly to the timed-ticket line. No Alcohol permitted on the property. Smoking is not permitted in any cue lines or in the fields. Smoking is permitted in designated smoking areas only. Field of Screams uses strobe lights, fog, and fire effects. These effects can trigger symptoms for those with asthma or seizure disorders. Please bring an inhaler if you use one for asthma. Those who are pregnant or have heart conditions are not encouraged to attend the event. We do not recommend young children attend the Field of Screams. Please wear appropriate clothing. We are located on a working farm. Expect some dirt and occasional mud. Proper shoes are required. No flip-flops, sandals, or high heels. 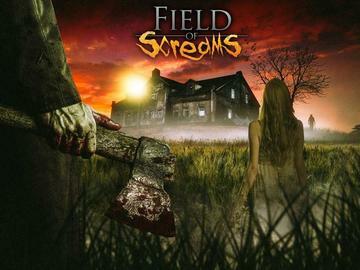 Field of Screams reserves the right to refuse entry to anyone. Visit ScaryPrairiePines.com for all the details. All events are operated by Prairie Pines Festivals L.L.C. Please call (316-303-2037) or e-mail (screams@prairiepines.com) if additional help is needed.